Equip your skid loader with . . . 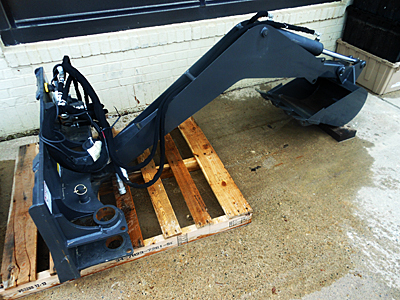 Turn your skid loader into a real workhorse with one or more of these handy attachments. 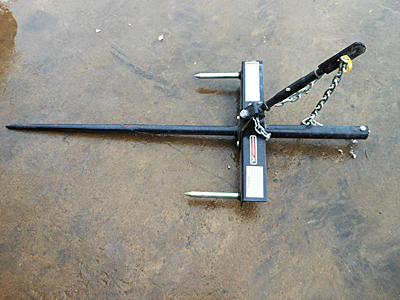 New US AG GEAR heavy duty bale spear for round or big square bales. 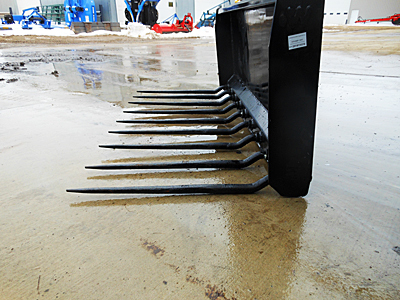 Has six 49" long tines with 44" usable length, universal SSL Q-tach plate. Notch NQQ-DB quad bale spear, will pick up two round bales, SSL mount plate, four 49" tines (43" tines are available). with four 32" Conus I forged spears, 66" wide frame, 2,000 lbs. capacity, weighs 260 lbs. We have two units in stock. Berlon BSC-144324 bale spear, three 32.4" Conus I tines, one 44" Conus II tine, universal SSL Q-tach plate. Walco Renegade 124415 single SSL bale spear with 39" tine and two stabilizers. Five units in stock. Walco Renegade 124421 double bale spear with two 39" tines, Euro quick tach mount plate. (Optional 49" long tines are available.) We have two units in stock. with three 32" tines and one 49" tine. We have two units in stock. Walco Renegade 124425 SSL triple bale spear with 39" tines. with one 49" bolt-in taper spear and two stabilizers. with one 42" forged spear, two stabilizers and chain turnbuckle to secure spear to bucket. Equipped with bolted tapered spears. Rated at 2,000 lbs. Used John Deere (custom made) 3-tine bale spear, three 32" Conus II tines with JD Q-tach plate. Fits 2" receiver. We have two units in stock. Walco Renegade 146324 Euro to universal SSL adaptor. Hook & pin this adaptor to your Euro quick attach on your tractor loader to allow usage of SSL attachments. We have two in stock. New Berlon Class III 10,000 lb. pallet fork set, 2" thick X 5" wide X 48" or 60" long forks, with steps on both sides. Black color. Forks are built in the U.S.
Berlon BPFF-48-2 5,500 lb. 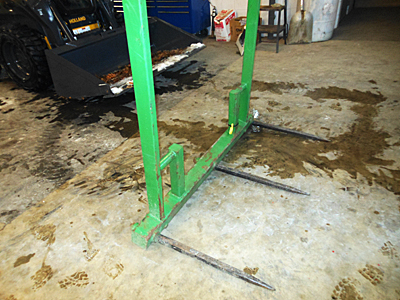 48" pallet fork set, Euro Q-tach mount plate, full width brick guard, step on both sides. Forks built in the U.S. Two units in stock. Berlon BPFF-48-2 5,500 lb. 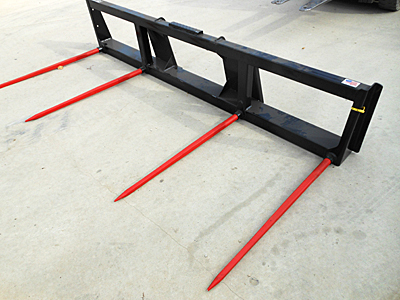 48" pallet fork set, Uni SSL Q-tach mount plate, full width brick guard, step on both sides. Forks built in the U.S. We have five two units in stock. Berlon BLD PFF-42 Class II pallet fork set, 2,500 lb. capacity, weighs 275 lbs., forks are 4" wide X 1⅜" thick, has universal SSL Q-tach plate. Pallet forks & mount plate are all USA made. We have five units in stock. three height settings up to 74". Includes hydraulic cylinder and hoses with flat-face couplers. Berlon WTBPFF-48-2 48" 5,500 lb. pallet fork set, Class II walk-through design with uni SSL-mount plate and a step on both sides. Forks are made in the U.S. Six units in stock. Same pallet fork set as above but 54" long. This set has been sold, but please call for current price and availability of a new set. Berlon WTBPFF-48 48" 4,000 lb. pallet fork set, Class II walk-through design with uni SSL-mount plate and step both sides. Forks are built in the U.S. We have four units in stock. New Berlon BPFF-48 Class II 48" 4,000 lb. 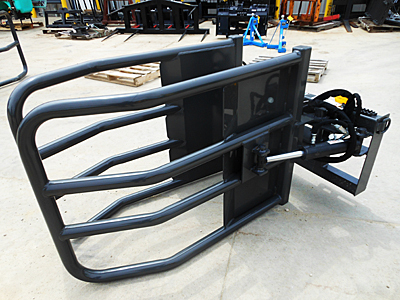 pallet fork set with SSL mount plate. Forks are built in the U.S. We have four sets in stock. planetary gear reduction with 2" hex output shaft. Weighs 350 lbs. Complete with hoses and flat-face couplers (less auger bit). Auger bits available in sizes from 6" to 36" diameter. 12" bit @ $370. Drive unit lists @ $2,595. with hydraulic hoses and flat-face couplers. Great for cutting ditch banks, clearing ponds & cutting trails. 42" cutting width, 16' vertical reach. Weighs 1,200 lbs. New Precision ED6451 extreme duty HyReach SSL mount tree clipper with optional "CLAMPit" grapple and backstop, maximum cut capacity up to 12", wireless remote control rotates cutter head from horizontal position 90 degrees to vertical position, has 10-foot reach. U.S.A.-made in Sedalia, Missouri. Click here for more photos, video. Precision Mfg. ED6451 Extreme Duty tree clipper, skid steer mount, fully plumbed with hoses, couplers and wireless remote kit. Features five stabilizer bars, extra gussets on rotator, extra long upper and lower plates on clipper head, power rotate up to 110 degrees. Cut dead or live branches, easy release to avoid limb wedging between blades. Lists @ $6,675, plus freight and predelivery. Weighs 929 lbs. Model TRSHM, 5" bore cylinder with 12" stroke, flat-face couplers, 12" diameter capacity, 30-ton shear force. with hoses and flat-face couplers; pulls post up to 8" diameter and trees up to 6" diameter. Four units in stock. Virnig TRP tree/post puller with hoses and flat-face couplers, jaws open to 11.5", hard stop at tip keeps small space between teeth when fully closed, allowing even small trees to be pulled without shearing them off. Includes cylinder protection cover. Weighs 462 lbs. Lists @ $1,945. New Notch NTP tree/post puller-digger with push-bar guard. Pointed barbed jaws allow digging and cutting roots to ease removal of trees/stumps. Cylinder mounted on back side of puller to protect from being damaged. Shipped with hoses and flat-face couplers. We have two units in stock. New Baumalight Stump Blaster S18-S450 universal skid steer mount stump grinder, 24" diameter rotor with 34 replaceable teeth, up to 10" cutting depth below ground, 5" maximum cutting depth per pass, self-feeding swing arch. Includes flat-face couplers. Requires one set auxiliary hydraulic couplers. Requires 12 to max of 23 GPM. Also available with 12-27 GPM and 25 to 40 GPM. New Holland blue color. Weighs 642 lbs. 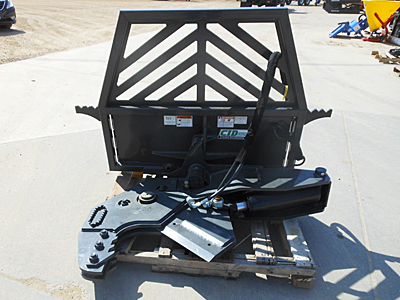 New Virnig LLV78 78" land leveler with two 5/8" X 8" bolt-on reversible/replaceable cutting edges, 51.5" overall depth. Weighs 790 lbs. Hydraulic scarifier ready. Lists @ $2,175. New Virnig SBHV101 101" heavy duty snow/light material bucket, 62.6 heaped cubic foot capacity with 5/8" X 8" double-bevel, bolt-on reversible cutting edge. Weighs 1,381 lbs. Lists @ $2,865. New Virnig MSHV101 V50 101" medium duty snow/light material bucket, 44.5 heaped cubic foot capacity with 5/8" X 8" double-bevel, bolt-on reversible cutting edge. Weighs 961 pounds. Lists @ $2,315. New Virnig MSHV96 96" medium duty snow/light material bucket, 42.6 heaped cubic foot capacity with 5/8" X 8" double-bevel, bolt-on reversible cutting edge. Weighs 959 pounds. Lists @ $2,335. New Virnig MSHV84 84" medium duty snow/light material bucket with 5/8" X 8" reversible bolt-on cutting edge. Weighs 876 lbs. Lists @ $2,220. New Virnig SLHV84 84" standard snow/light material bucket, 31.0 heaped cubic foot capacity with 5/8" X 8" double-bevel, bolt-on reversible cutting edge. Weighs 754 pounds. Lists @ $1,810. 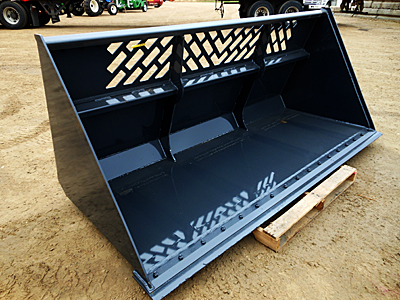 New Virnig DHV72EX low-profile 72" dirt bucket with bolt-on cutting edge. Weighs 674 lbs. New Virnig HDHV78 78" heavy duty low-profile dirt bucket with factory installed bolt-on cutting edge. Recommended loader capacity greater than 2,400 lbs. Weighs 840 lbs. Lists @ $1,790. 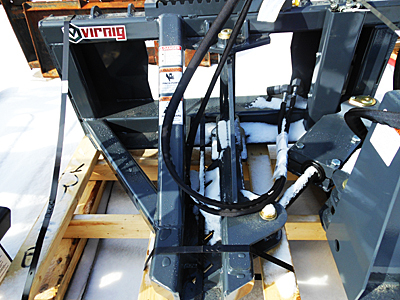 New Virnig EDV78 78" low-profile dirt bucket with factory installed bolt-on cutting edge. Weighs 596 lbs. Lists @ $1,445. Used Berlon MDHV-84 84" medium duty high volume bucket with factory bolt-on cutting edge, 29" tall, 39" deep. Like new. New list @ $1,822. Weighs 781 lbs. Ideal for digging stumps or rocks, trenching and breaking up compacted soil. With replaceable cast teeth. weighs 390 lbs. We have two units in stock. three sizes: 72", 78" and 84"
New Virnig BSGV84 84" open end skeleton grapple bucket, dual independent grapples with hoses and flat-face couplers. Weighs 845 lbs. Lists @ $3,100. New Virnig BSGV72 72" open end skeleton grapple bucket, dual independent grapples with hoses and flat-face couplers. Weighs 800 lbs. Lists @ $2,750. Equipped with dual independent grapples and hoses with flat-face couplers. with dual independent grapples, hoses with flat-face couplers, 9 cold-rolled steel tines, weighs 1,100 lbs. New CID XROKG78 78" X-Treme rock grapple bucket, two independent grapples with cylinder hoses and flat face couplers, cylinder guards, has removable side end plates for logging when not using for picking rock. Weighs 1,087 lbs. Lists @ $3,770, with freight. New CID XMFG72 72" X-Treme manure tine fork bucket with dual independent grapples with hoses and flat face couplers, cylinder rod guards, nine 2" diameter by 32" long tines, weighs 877 lbs. New Walco Renegade 145215 72" manure tine fork bucket, nine 36" long conus tines, universal SSL quick tach plate. with hoses and flat-face couplers. Bolt-on reversible/replaceble cutting edge. Also available in 72", 78" and 90" widths. Weighs 820 lbs. Lists @ $2,210. 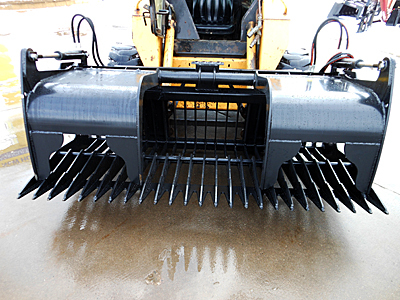 We have a variety of snowblades and snow buckets that will convert your skid loader into a snow-moving monster.